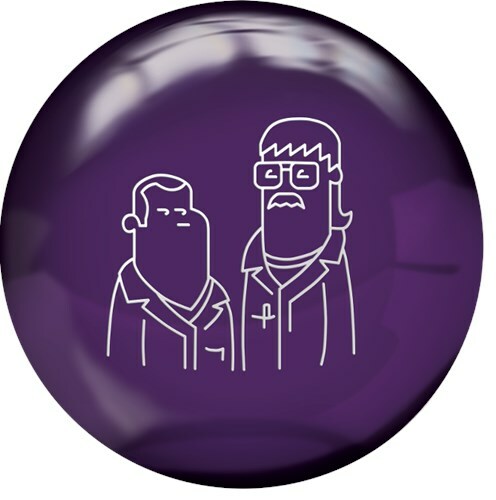 The Radical Spare ball features caricatures of the two brains behind the Radical brand of bowling balls, Phil Cardinale and Mo Pinel. These two dudes are an odd couple but together produce great bowling balls. This spare ball is an exception to the Radical brand since it does not utilize the advanced technology usually found in a Radical ball. This ball just rolls straight to help pick up those pesky spares. That is still kind of radical! Color: Purple Solid All colors do vary somewhat from the picture shown. By Team Anchor, Flight 19 from Riverside, Ca. Rolls straight as an arrow! knocking down the pins that escape the 1st ball! Need a little help on the spares, Phil and Mo are onboard! I moved up from a 14-lb ball to my current 15-lb purple Radical and the pins are going down!!! What more can I say. It goes perfectly straight. Do you have a 15lbs 0oz - 15lbs 3oz? Hey Bill! You can always request for a weight range in the special comments box on the last page of the check out process. does price include drilling and what measurements do you need? Hello! Drilling will be an extra $14.95 and you choose the size drilling you need. Due to the time it takes to produce the Radical Spare Ball ball it will ship in immediately. We cannot ship this ball outside the United States.